On a recent trip to check things on our boat, the fresh snow on Mt. Baker really made the mountain stand out, especially on these cold and clear winter days. This shot is looking north from our marina across Fidalgo Bay. 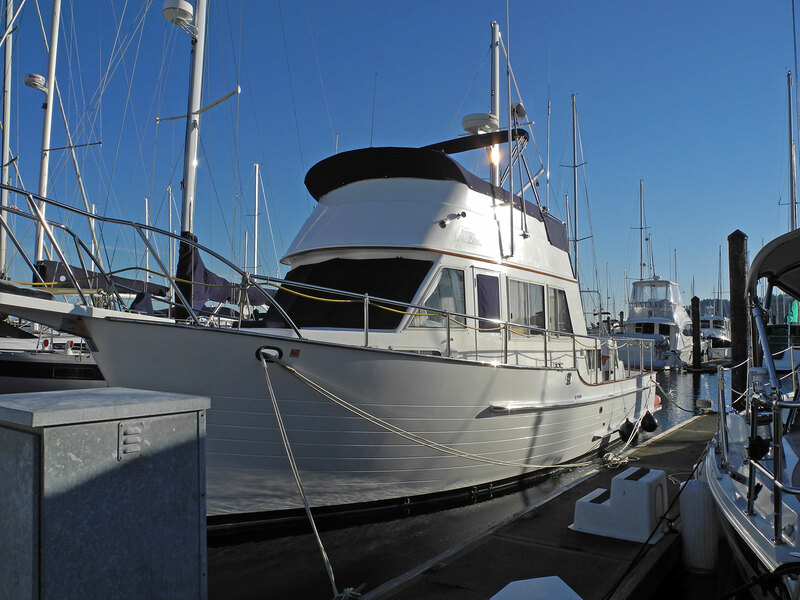 We try to get back to Anacortes a couple of times during the winter to check our dock lines, make sure everything else is okay, and run the engine, genset, and other systems. 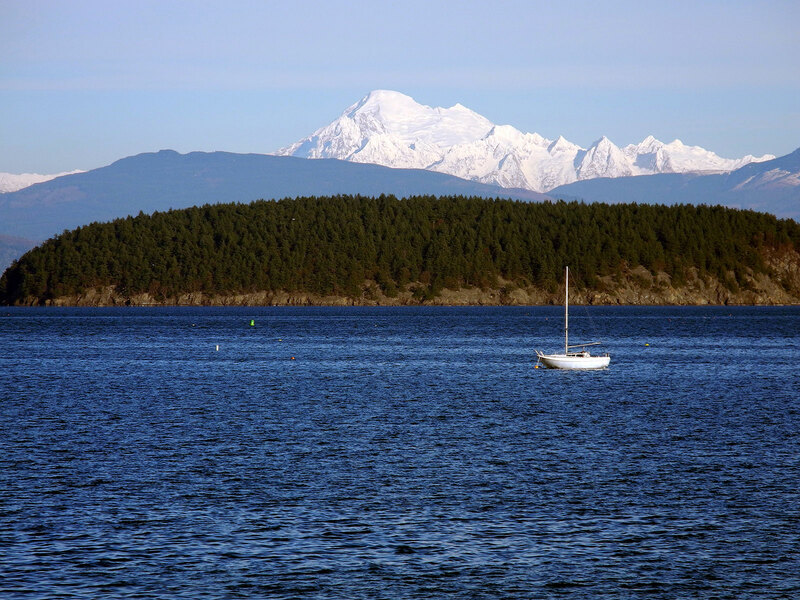 Since it had been almost two months since we left the boat in early October, we were starting to look for an opportunity to head back to Anacortes before winter weather sets in and travel becomes more difficult. So, when we had some settled weather recently, we decided it was a good time for a trip north. Even though we have friends who are around the marina, it’s always better to be there ourselves to see first hand what’s going on. This time Jim made the trip by himself, as it’s so much easier when I stay home and we don’t have to close up the house and haul along our kitties. Travel for Jim’s drive—weather, road conditions, and traffic—was good both on the way up and back. Which is good, since the drive takes 8 to 9 hours each way. We were happy to find that things on the boat are looking good, and nothing else broke while Jim was running the various systems. 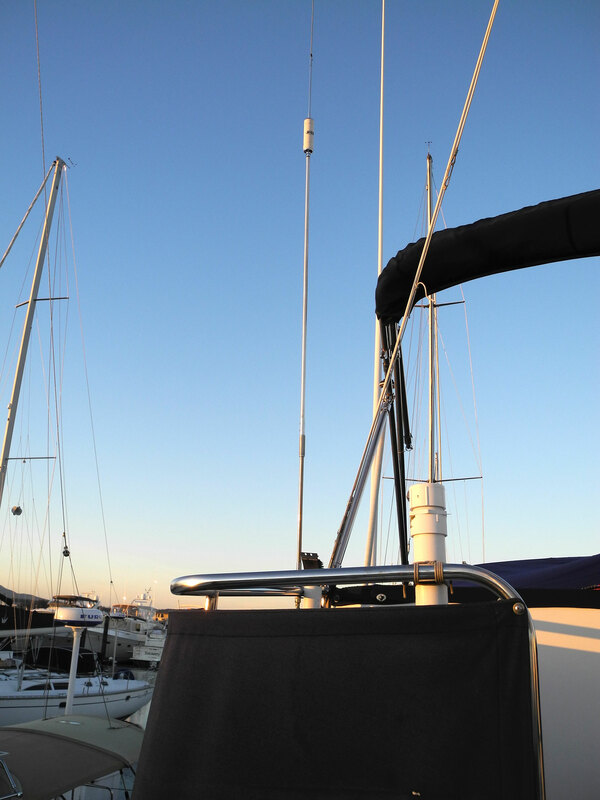 Our Webasto heater worked great and kept the boat warm…important this time of the year! The weather was sunny and clear, but the clear skies resulted in cold nights and icy docks in the mornings. Construction of the roundabout at 22nd and R Avenue was still in progress, and some of the digging disrupted our BBX Wi-Fi connection, so Jim didn’t have any Internet service over Wi-Fi while he was there. Cell service filled in the gap. In addition to checking up on the boat, Jim had a couple of small projects he wanted to take care of while he was there. The first project was to finish the installation of the new house batteries. 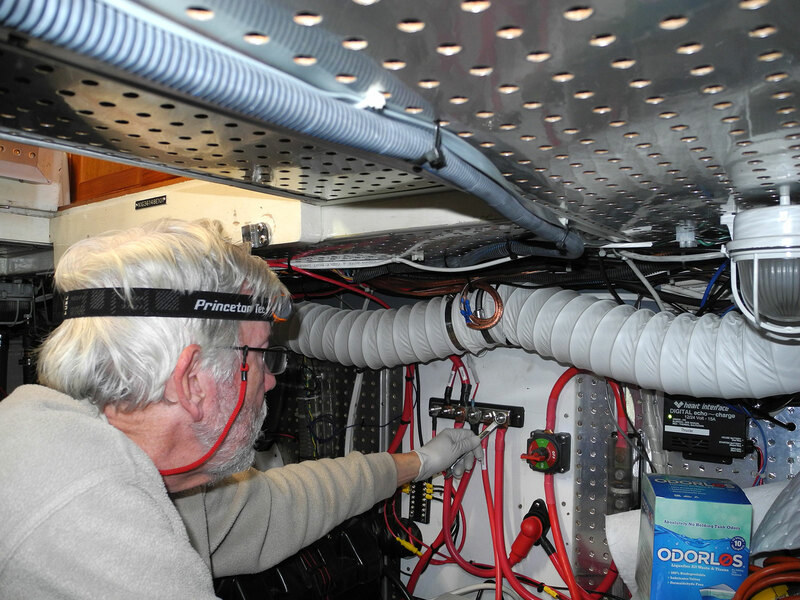 For those of you who have been following our blog, you may remember that Jim made a trip to the boat last August to install new house batteries and re-wire the battery cables. We published this post on August 11 with that story. At that time, Jim came up short two red cables for the positive distribution system, and had to use black cables in order to finish the work. Since then, we have acquired the two red cables, and on this trip he installed the red cables in place of the temporary black ones. We feel better knowing the cables are the proper color for safety. 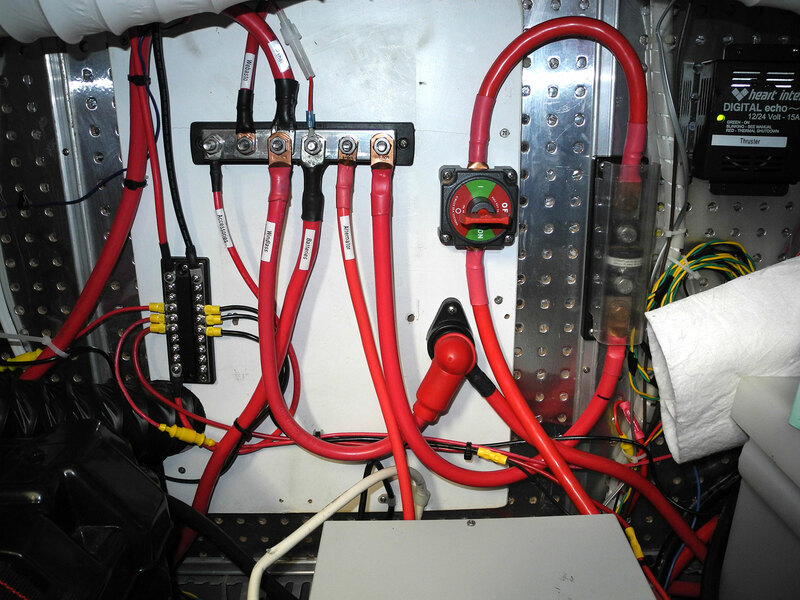 After Jim replaced the red cables, the battery positive distribution board now looks as it should. Jim down in the engine room is tightening one of the nuts on the bus bar that attaches the battery cables to the positive distribution board. The second project had to do with Jim’s ham radio. He’s been trying off and on for the last three years to get his high frequency ham radio installed and working on Phoenix. 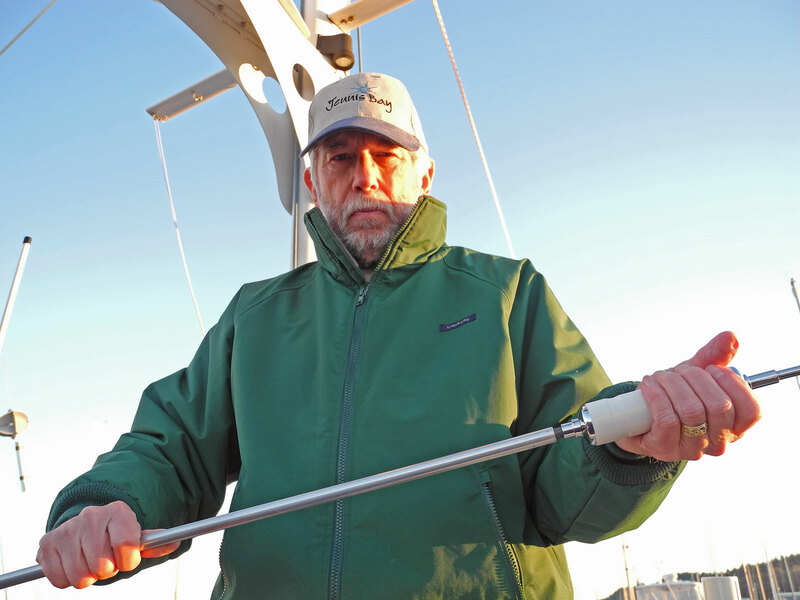 Armed with a new antenna analyzer, Jim was able to get the antennas tuned. On the day he was testing, there was a lot of electronic noise on the radio. This may be local to the marina. We’ll have to wait to find out until we are able to get away from the dock. Jim is holding one of the ham radio antennas before mounting it. It was so cold, he forgot to smile! This shot, taken from the stern, shows one of the ham radio antennas attached to the port rail on our fly bridge. Jim spent only a couple of days on the boat, but it was long enough to verify that everything is okay. Fortunately, he made it back to Bend before this recent extreme cold snap. Jim left a lot of the winter canvas covers on the windows for additional protection from the cold weather. He left the canvas covers on the north-facing windshield and on the side of the boat in the shade (the starboard side at the time this photo was taken). He took off the covers on the port side to let in the afternoon sun and gain a bit of heat. The canvas covers really help—all that glass really lets in the cold! This entry was posted in Life Aboard, Maintenance, Projects, Weather and tagged anacortes, batteries, BBX-Beacon Wi-Fi, ham radio, Mt. Baker, positive distribution system, webasto heater by Sailor Lady. Bookmark the permalink. Love the photo of Mt. Baker, so beautiful! Cold, indeed, minus 10, Allan would not be able to stand that. When it is 37 during the nights here, he is super cold. The outside cats all have heating pads and they use them. We had a bad wind storm yesterday and large tree limbs in our back yard. Other plants blown over, but we all got through it. Thanks for the update, always fun to read. This recent cold weather has been a bit over the top. Temps below zero are not that common in Bend, and certainly not normal to have it stay frigid cold for days on end. It’s been a record-setting cold snap, and we are very glad things are now moderating and our temps should be in the 40s by the end of the week. Cold nights in the winter here are normal, however, usually somewhere between the teens and 30s, so Alan would not be a happy camper here! Didn’t know about your windstorm, but glad you didn’t have any more damage than tree limbs and plants blown over. We’ve been thinking about getting some kind of a heating pad for Rosie, as she is always looking for a warm place. What kind do you use for your outdoor kitties? Send me an email with some details. Good to hear from you! Enjoyed , as usual . We, in tn. Having cold weather too. Today no sch , snow day without much snow. Hate it. Merry Christmas and happy new year . Thanks for the feedback, Sarah. Short days and winter weather aren’t my favorites either! We’ve been having an extreme cold snap here…it hasn’t been above freezing for the past week, and last Saturday night it was minus 10 at our house (Sunday’s high was 9), and there were colder temps in other parts of Central Oregon. Set records. We have about 4-5 inches of snow on the ground too. Warmer weather is coming…today it’s supposed to reach 35, and warmer even by end of the week. Thank goodness! Enjoy your holidays!